After so much longings about a trip; my gang and me decided to travel to Hasan district of Karnataka which is famous for its best architecture created by Hoyasala Dine sty.Our first reach out is Shravanabelagola from Koramangala (Bangalore), we were five started at 5 AM in the morning by Qualis on the way at Hennur picked up another friend so total we were six. Reach Kunigal and from there 52 km continue on NH 48 to reach Hirisave continue 16 km and Turn Left from Hirisave that connects to Shravanabelagola, from here every thing is easy to reach Halibedu and Beluru. We traveled around 580 KM in this whole trip. Finally we reached top of the hill where we can see huge (57 Feet)Bahu bali / Gomateswara idol. As it was one of the best pilgrimage center for Jains; we found so many Jain's and foreign tourists as well. I was surprised to see the tourists actively climbing the hill with out any fagged feeling. Got to know that this huge idol was build by king "Chamundaraya". The word Shravanbelagola means "The white pond of the Shravana" -as the name suggest there is nice pond we can see from the top of the hill, nice scenic view from the top of the hill. Just beside this hill we can see another hill called Chandragiri(Chikka betta) which has many memorials to other Jain monks. It is believed that emperor "Chadragupta Mourya" meditated on this hill. By the way there were Palanquin facilities from the down of the hill to reach up of the hill, around 400 INR were charged for this. There were so many inscriptions on the way to Bahubali, most of them were written on old kannada and Marathi. I was telling my friends there should be a wonderful language compiler for all the indian old and new languages which will convert from any to any; dreaming that at least our next generations will decode the photos we have taken for all those inscriptions to understand the history. There were many theerthankaras idols placed behind the Baahubali idol. For every 12 years there will be "MahaMastakabhishekam" performed for this huge idol; in which they will perform abhishekam with ghee, milk, gold coins and saffron. It is a spectacular ceremony. the next will be in the year 2018. We skipped to visit the chandragiri to visit other places in plan. Coconut water is my all time relaxing technique which again I applied after getting down from the hill and quickly started Off to Halebidu which is 78 km from Shravanabelagola.On the way we stopped for Lunch in Hasan town. Food was average though we have choosen the best hotel in the town and in the heavey rain itself we started to Halebedu to save the time. By the time we reached Halebedu, climate was good and entered the uncompleted, Hoyasaleswara temple constructed by Hoyasala dinesty kings ...Halebedu which was previously called Dorasamudra or Dwarasamudra) was the regal capital of the Hoysala Empire in the 12th century. Surprising thing to know was the word "Halebedu" means ruined city. Guide was many times telling that it was invaded by Bahamani sultan and other Muslim kings who ruled the near by places. But how come they would have thought of invading this much great sculptures. In this place there were two uncompleted Hoysaleshawara and Kedareshwara temples and before them two big bulls (Nandi's) and also one big lake called as Dwara samudhra which means entrance from ocean by which the name of the village too. 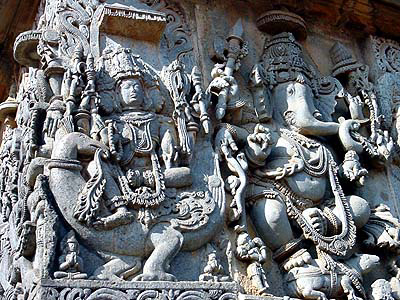 The two big monolithic Nandi's and many sculptures in the temple were made of soap stone or Chloritic Schis. One will definitely gets amazed while seeing the beauty and understand the view of artists who carved these sculptures.There are beautiful and numerous sculptures surrounding the temple as well as inside the temple. I can't express the fineness of these sculptures one has to see and feel it. There is one archeological museum inside the temple premises which has few invaded stones and uncompleted sculptures. We reached Beluru around at 4:30 PM; it is just 16 KMs from Halibedu. The temple here was Chenna Kesawa swamy (Good looking Vishnu in meaning). Unfortunately the temple was closed for that day. Unlike Halibedu, Beluru temples were 100 % completed. Even Sri krishna devaraya has done some renovations to this temple during his kingdom. King Vishnuvardana and his qween Shantala devi who has paid attention and developed these two places.As like all the temples there was pushkarani in this temple complex as well. The surprising stuff is that, there was one prototype temple in the same complex which we can see for the original temple. The star base for both prototye and main temple was really powerful. The sculpture and temple architecture is simply superb. I don't think modern artists can build this kind of fine artistic monuments just with hands.The temple is one of the finest examples of Hoysala architecture, there is no doubt for this. Belur and Halebedu architecture reminded me my trip to Somanathapur , because the architecture is same in these three temples, the fine ness and techniques in carving these sculputures are same they look almost same but different in views of different artists. The imagination and views of the artists who carved all these sculptures are from our Puranas, Itihaasas, technology, culture, Habits, Intersts to Kamasutras. One line to say about these two places is "Belur - Halibedu are pride to India in terms of its culture and its standards". I never imagined 2D and 3D views in the sculptures till I see this place. Hats-off to the creativity of architects and artists involved in this great fine monuments and sculptures in this temple. Finally we started our retrun journey to Bangalore around at 7 PM and everybody took rest and reached our places almost by mid-night. btw, want to mail you.. can u drop me a line to aaroo4 at gmail dot com pls!